Over the past 15 years of my career as an environmental attorney, an advocate and a fundraiser, I have grappled with the question of how my contribution can truly make a difference. I often draw solace and inspiration from SEHN’s way of working, of telling the story of a paradigm shift. SEHN is patiently and tirelessly describing the contours of a more just, earth-bound, peace-bringing environmental policy framework, offering clear and comprehensive alternatives to our current legal and scientific frameworks that allow for the continued disregard and destruction of the earth. Watching SEHN so effectively tell these stories – of the precautionary principle, ecological medicine, guardianship, law for the ecological age – has inspired me to strive to be a voice for what is possible. I asked myself about the deeper potential inherent in environmental justice advocacy; these were my thoughts, in response. What happens when a story is told effectively? People listen, and are moved. Change can occur. We can look at advocacy, at its most basic level, as storytelling with a purpose, towards an impact. As advocates, we must discern: Which stories do we tell? To whom do we tell them? How do we tell them? Inherent to the achievement of justice is the telling of stories. In a dispute, advocates tell competing stories. Ostensibly, justice is served when the arbiter validates one story over the other, the story which most aligns with the law. Law is the codification of a shared set of values. Values shape the law. The law then shapes the parameters according to which individual stories may be told. What are the values that underlie our present system of justice, which in turn shape the way that we tell stories within that system? Here are a few: the maximization of economic value is the highest good; the earth is a collection of resources; people are entitled to exploit those resources. What results? The commodification of the sacred, of all life. Disregard for the lives of people who live with or upon land and resources that could be exploited for financial profit. How do we bring about a change in these underlying values? Who are the people we must address, what are the stories we must tell, to shift our collective values towards the good? Which narratives must we surface in order to alter our shared cultural narrative, moving towards sustainability, balance and peace? And how do we tell those stories when our system of justice is not yet trained to hear and digest them? The advocate’s dilemma: withdrawing our complicity from tyranny, while at the same time operating within the parameters of a system that generates and perpetuates tyranny. We recognize that the achievement of true justice is beyond the present capacity of our legal-economic system. Simultaneously, we strive for justice according to the terms of that system, in order to protect the land and the people as much as possible while driving systemic change through the introduction of new narratives. How do we defend a sacred, alive world within the confines of a system that has no concept of the sacred, which instead sees the world as a collection of non-living resources? 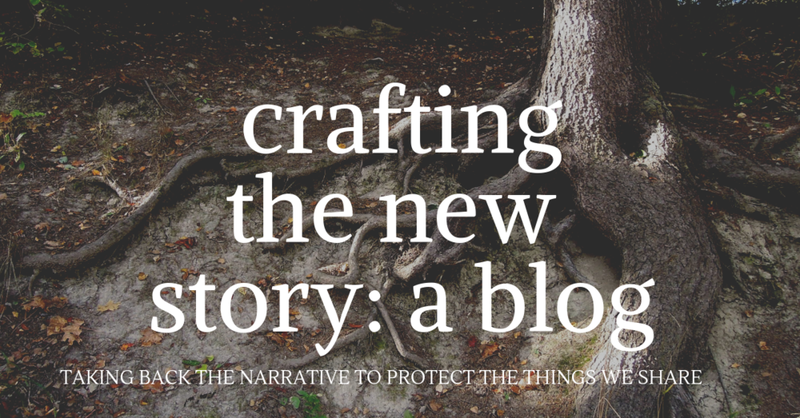 By telling stories which refuse devastation, according to the terms of the system, and by telling stories which say yes to alternate narratives that transcend the supposed duality between economic progress and ecological protection. The legal system tells stories of ownership of property, competition for scarce resources, separation. Groups like SEHN tell stories about life. Community, future generations, the interconnectedness of being. These are narratives in opposition to one another. Yet we cannot hope to “win” with an oppositional approach. We must tell stories that dance at the edges of the system’s capacity to comprehend and to act. We engage with the internal logic of the system, while laying a pathway for that logic that leads to a new result. We offer paradigm-shifting ideas, like the precautionary principle, that are nonetheless digestible and able to be assimilated by the system. We advance ideas and take actions that are like strong shoots breaking through the concrete of man-made law, allowing natural law to meet the light and air once again. Which stories do we tell? Stories of life. To whom do we tell them? To the decision-makers, to the people, to future generations. How do we tell them? In the language of power, in the language of the heart.